At Friendship we do routine dental cleaning, have advanced imaging with digital radiography and perform extractions if necessary. Sometimes more advanced techniques such as a root canal, complicated jaw fracture or aggressive surgical excision of oral cancer are required. 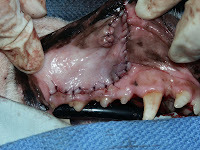 For this we usually refer outside of the hospital to any of the veterinary dentistry specialists. 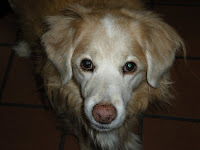 Unfortunately, I have personal experience with aggressive oral surgery, because my dog Westin was diagnosed with oral melanoma in April 2008. In my opinion, Dr. Mark Smith and Dr. Kendall Taney at the Center for Veterinary Dentistry and Oral Surgery are gods in the world of veterinary dentistry. Not only were they sympathetic and caring but the surgery they performed on Westin was amazing. The type of tumor she had required wide surgical margins to make sure all of the cells were removed and given the location there was not a lot of extra tissue in the mouth to work with. Performing cutting edge techniques, they excised the entire tumor while barely leaving a scar. I cannot thank them enough for helping me with Westin and, when necessary, I send my clients to them with the utmost confidence in their abilities. 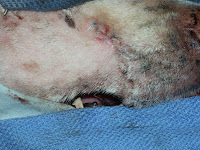 Pictured above are the photos of Westin after surgery. You can barely see the incision on her muzzle. Amazing!